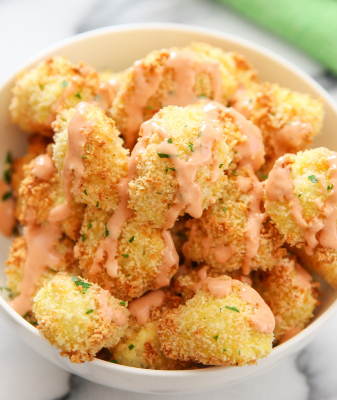 Crispy baked cauliflower bites are drizzled with an addictive and easy bang bang sauce. I’ve recently become obsessed with bang bang sauce, a creamy sweet and spicy chili sauce that is easy to make. It tastes great for dipping chicken, seafood, vegetables, just about anything really. So I decided to apply it to cauliflower. 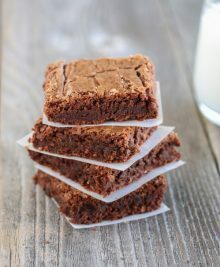 I’ve got a couple healthier recipe ideas to share and then we’re moving onto sweets, baked goods, chocolate and more chocolate. So until this moment, I haven’t really paid attention to this song, but I immediately knew that lyric made no sense. What kind of everlasting love only has him loving her until she’s 17? The actual line is “And, darling, I will be loving you ’til we’re 70.” (Which actually still seems a little short to me. Is he going to dump her after 70?) After I pointed out the correct lyric to Mr. K, he acknowledged that made much more sense. Now I can’t listen to that song without laughing. Feel free to play around with the ratios and even try out different hot sauce variations. I used sriracha but you can try others. I also used low-fat mayonnaise but you can use regular mayonnaise. I think I’m going to whip up a batch this Sunday to use for a general dipping sauce for all the fried foods we are having. 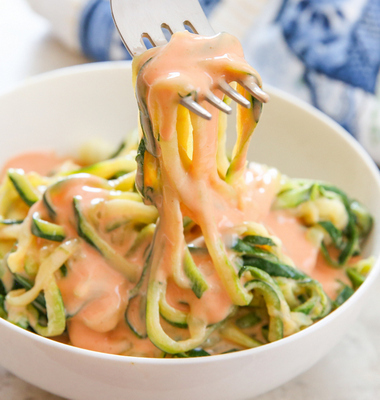 If you enjoy this recipe, be sure to check out my Skinny Bang Bang Cauliflower, Bang Bang Pasta, and Skinny Bang Bang Zucchini Noodles. 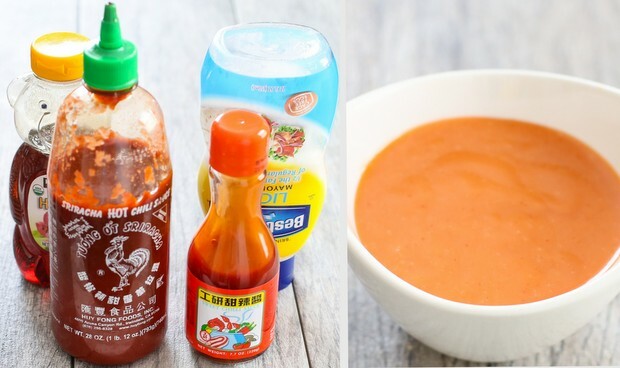 Bang bang sauce is a creamy sweet and spicy chili sauce that is easy to make. I use it in a lot of recipes for dipping chicken, seafood, vegetables, just about anything really. 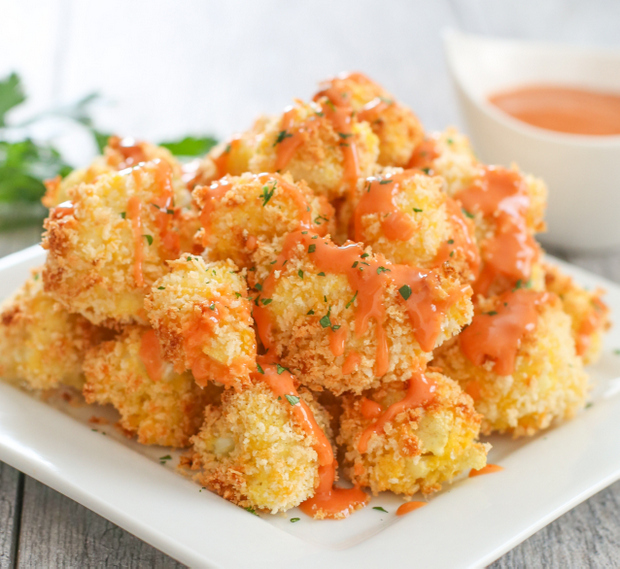 In this recipe, I drizzle it over some crispy baked cauliflower for an easy main dish or appetizer. Preheat oven to 400°F. Dip cauliflower pieces in egg and then roll in panko until fully coated and place on a baking sheet lined with parchment paper. You will need to use your fingers to press on the coating to help it to stick to the cauliflower bites. Repeat until all cauliflower is coated. 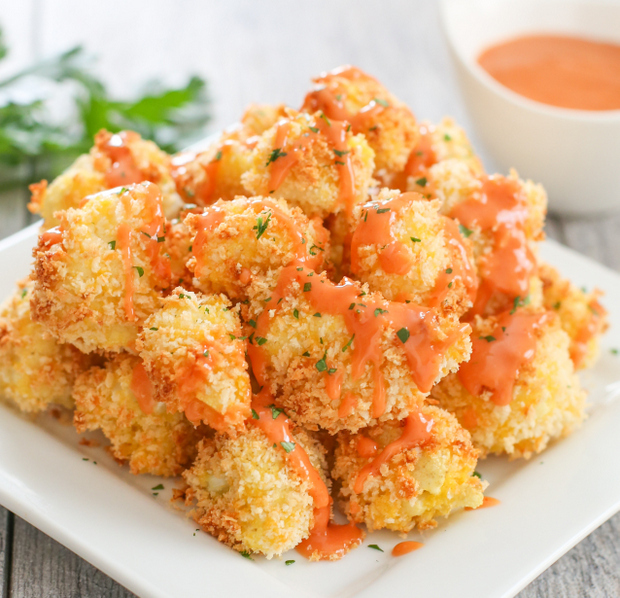 I love that you’ve combined two totally underrated things to this recipe: cauliflower and bang bang sauce. I definitely want to try these! I will laugh when I hear this song next time! Im surprised I haven’t seen bang bang on cauliflower. 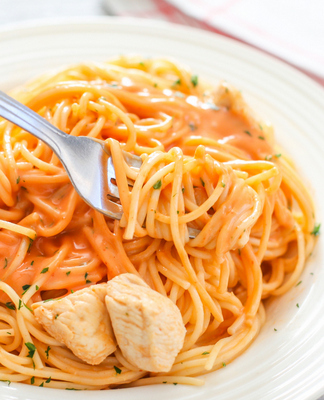 I keep seeing it on shrimp and chicken, but it’s so good for just about anything! I hear that song all the time (thanks to a teen in the house), but I haven’t really *listened* to the lyrics because I thought he says 17 too! Back to the sauce – what brand of sweet chili sauce do you use? haha, that will make Mr. K feel better. Good question–so I went to ranch 99 and basically bought the cheapest bottle. I made sure to buy the one that looks like ketchup rather than the one with seeds in it which would make the sauce look lumpy. I just updated the post with a photo, hope that helps. No English name written for the brand. This looks amazing, Kirbie! No one will ever skip veggies like these! hehe, yes it’s a great way to eat your veggies! I was just dunking these in the extra sauce. haha! 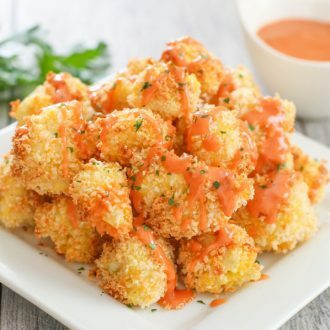 I love bang bang shrimp.. and chicken too – so what a delicious idea to make a cauliflower version. These look so addictive, crisp and moorish! Bang bang shrimp is next on my list! I was dying laughing when I read this post b/c I SWEAR *I* thought the guy said 17 in the song too!! I made BF listen to it several times and he even thought the guy said 17. It was only recent that I took the time to relisten to the entire song and heard 70. I love that song! I am such a fan of your cauliflower recipes. 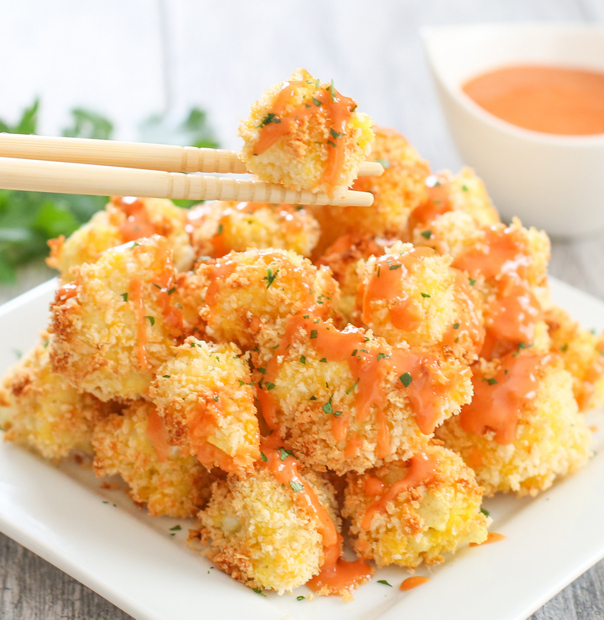 Do you think it’s possible to sub the panko for crushed parm cheese for the coating? that’s funny so many people hear 17. when i heard Mr. K sing it, I was like “that can’t be right!” But i think it makes him feel a little better knowing that others hear it that way. I made this for dinner tonight and it was soooo good!! I would not have expected so simple a recipe to be so delicious. Thank you for sharing! I am in love with that song and my husband finds it super boring!! Men, I tell ya!! hehe anyways your’s atleast tries to sing it though!! 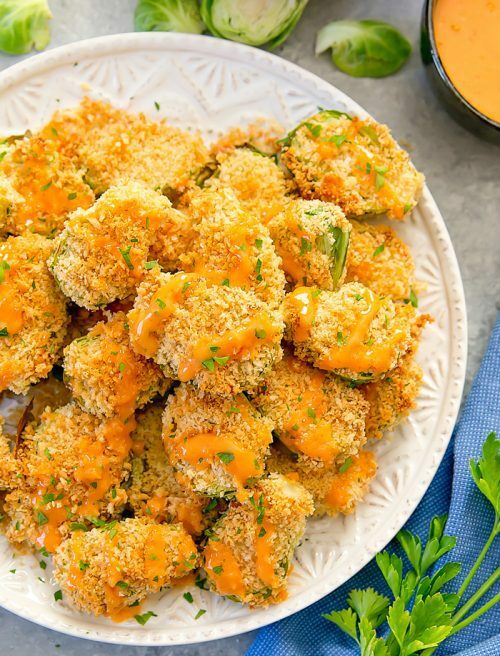 These bites with that sauce are just the perfect weekend munchies I needed!! Yumm. they do make a great munchie, don’t they? My husband actually likes a lot of of the slower, love songs, sometimes even more than me! haha. It’s not really vegetarian because of the egg. Is there an egg substitute I can use? Eggs are from mammals, it’s not vegetarian. The cauliflower pieces should be raw before dipping in egg? Or shoul they be boiled before? OMG you brought back the funniest memory. My husband hums and sings a lot. He has an affinity for Christmas Carols. About 15 years ago he was singing We Wish you a Merry Christmas…..”now bring us some piggy pudding, now bring us some piggy pudding” I stopped him and I could barely get out “did you say, snort snort, Piggy Pudding”. He said “yes”. I said, now I am getting that crazed kind of laughing where you can hardly speak…”it’s actually Figgy Pudding” He just kind of looked at me for a minute and said “well, that’s ridiculous, that doesn’t even make sense”. Honestly I was laughing so hard I couldn’t even speak. Trying to recount the story for my co-workers the next day, I had to leave the room, I couldn’t even get the story out. Ahhhh, good times, good times. I can’t wait to try this. It’s gonna be the main dish with stir fried veggies! 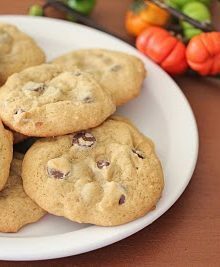 Hey.. A friend pinned your recipe.. Of course it caught my eye.. Due to the Kirbie’s Cravings.. Our last name is spelled the same, which I don’t see often.. Hum ..we may be distantly related!! Good job. Gonna try these!! hi Rhonda- that is so awesome that your last name is Kirbie. Kirbie actually isn’t my last name–it’s more of an online nickname/username my friends came up with in high school for me. I’ve never met anyone with the last name with that spelling though, so that is pretty cool! I referenced your recipe in my latest poast. It looks amazing. I am going to put this on everything!!!! Thanks for sharing this! I subbed out some ingredients for vegan-friendly options (vegan mayo, flax meal/water for eggs), and it was FANTASTIC! It’s the first vegan meal I’ve had since starting an allergist-appointed diet that I was totally happy with. Thanks again! so glad you got it to work for you! The only thing wrong with this recipe is that you will discover that one head of cauliflower is not enough! I wanted to eat the whole thing myself! 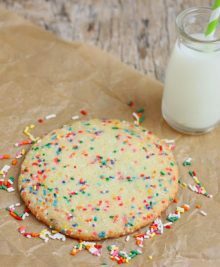 This is simple, easy, and delicious! I’ve also thought of a dozen different ways that I want to use the Bang Bang sauce too! I feel your pain. I always eat more than one serving of this! Just had this tonight and my son said that I’ve got to make it again! We are meat eaters and he thought it had a ‘meat like’ texture and taste. I didn’t have pancho breadcrumbs, I just whizzed up some wholemeal seeded bread and dried it in a low temp oven. Loved it! Thank you so much for this! My hubs and I love it so much 🙂 We have chickens who aren’t laying any eggs so I appreciate the flax seed/water substitute I read above. We’ll be bringing this to a friends house for Superbowl! Making 2 whole heads haha! yay! Hmm, maybe I should make this for Super Bowl! I was actually having a very “feeling down” moment when I read your post & I really wanted you to know that your lil husband story made me laugh so hard! I really appreciate that …along with the great recipe!! It’s funny how you never know where/when someone can make you smile…when you really needed it! The beauty of social media & strangers I guess???? Aww, I’m so glad my post was able to cheer you up. I never really realize people are reading until they comment and every once in a while I get a beautiful comment like yours as it makes me really happy. Your comment totally made my day! Thank you for taking the time to write it! Sooo delicious!! Made this yesterday and it’s a new favourite for us, LOVE it, thank you for sharing! that is so awesome to hear! glad you like it so much! Want to do this for a party but not sure how far in advance I can bread the cauliflower? Can I hold in the frig, till I put in the oven? Hmm, I haven’t tried it, but I think if you’re just putting it in the fridge for a few hours before putting it in the oven, it should be okay! This is to “Marsha” of the date of March 17, 2015; eggs are NOT from mammals! Since when do chickens, ducks, geese, quail, or any other bird, have teats with which to suckle their young??? And Kirbie did NOT claim anywhere in the recipe that it was “vegetarian;” just a sort of, but not really, hint that you need to read and research some things before commenting. Why do I want the recipe to read “skinny skinny bang bang?” Also, when my father was little he thought “’round yon Virgin” meant the halo behind her! My daughter and I ADORE Ed Sheerin and this song is one of my faves too. I swear I’ve always thought it was 17 too but I assumed he meant like he did when they were 17. Speaking of the daughter, she is 14 and has found a recent affection for cauliflower so we will for sure be trying this recipe. I have a lot of cauliflower recipes! I hope you try them out with your daughter soon. It’s funny how many people hear 17. My husband is happy to know he’s not the only one! lol! I haven’t seen that commercial but I need to search for it! How many servings does this make? It looks great and am excited to make it for Christmas. the recipes uses half a head of cauliflower so about 2-3. If you are serving it with other things, maybe four. You could always double the recipe if you need it to serve more. We made this last night ….YUM…it was delicious. Thanks so much . Definitely a keeper recipe.